The key to injera is getting comfortable with fermentation. 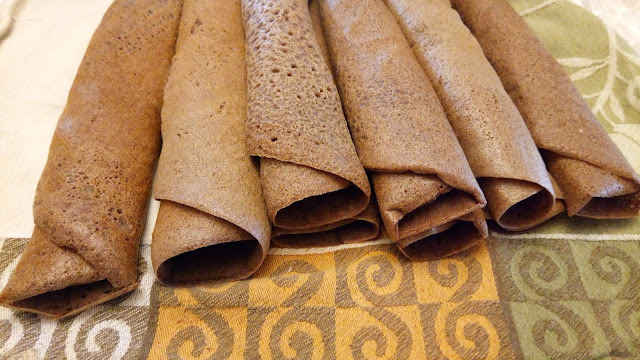 Just like sourdough bread, injera gets its flavour from wild (as opposed to commercial) yeast. But unlike sourdough, this recipe is much easier to prepare. A few days out on the counter and this batter will be happily bubbling away and ready to be made into Ethiopian flatbread. It’s a great introduction into the world of fermentation! The bread is gluten free but still rolls just like a crepe and is durable enough to scoop up whatever tasty stew you make. 1. Mix together teff flour and water. Pour into a large, clean glass or ceramic container (I use a 56 oz canning jar). Keep in mind that the batter will expand by 1/3 or more, so make sure you container is big enough. Secure a piece of cloth over the mouth of the container so everything can breathe–I put a cloth napkin over the mouth of the canning jar and secure it with the metal ring. 2. Let the batter sit for 2 to 3 days, stirring 3 times a day, until better begin to bubble and rise. 3. Once the batter is bubbly, stir in the baking powder and salt. 4. Let the batter sit while you heat a 10″ non-stick pan over medium to med-hi heat. 5. Lightly oil the pan. Pour 1/2 cup of batter into the pan and tilt to coat (thin batter with water if necessary). Cook until the injera has bubbles all over, then cover with a lid so the injera can steam for 2-3 minutes. Regulate the heat so the bread does not burn. 6. Remove the injera to a cooling rack and roll it while warm. Cover with a towel to keep warm. Repeat with the remaining batter.